For almost a year and a half, Parallels had the Mac virtualisation sector to itself. But now it has competition from the biggest name in the market: VMware. First, let's recap. The migration to Intel chips for Apple hardware begun in 2006 meant it was much easier to run Windows and other x86 operating systems on Apple-badged hardware. Three months after the first Intel Macs appeared, Apple released Boot Camp, which partitioned off a chunk of your hard disk to use for booting Windows. But if you wanted to use Windows you had to completely shut down OS X and reboot; you couldn't run them side by side. Today's Intel chips have provision at the hardware level for virtualising other operating systems. In other words, Windows can run "on top of" Mac OS X, and with Fusion or Parallels Desktop, you can have windows from Windows (or any other supported operating system, such as Ubuntu Linux or Solaris 10) sitting alongside your Mac windows and apps. Performance is much better than old emulated systems such as Virtual PC because virtualisation applications can access the processor directly. When Parallels Desktop first appeared, it was feature-poor. VMware seemed to be playing it safe, and have only now released the first iteration of Fusion. While clearly a 1.0 product, Fusion does show remarkable polish. It feels like a proper Mac application, bundling all the files for a virtual machine into an OS X package rather than leaving config files, hard disk documents and others loose. It feels solid, too. When switching from windowed to full-screen mode, it pauses to let the screen redraw out of sight, so you're spared the spectacle of Windows desperately trying to switch screen resolutions. VMware has an enviable pedigree in virtualisation, and while this is its first foray into the consumer market, away from its traditional enterprise focus, its experience shows through. Parallels can't currently virtualise 64-bit operating systems (not a great omission for many people) and can only virtualise one processor. Fusion however can do 64-bit OSs (on 64-bit hardware, of course) and virtualise up to two processor cores per virtual machine. While that's fine for laptop, Mac mini and iMac customers, those who've invested in a quad- or octo-core Mac Pro will be asking why the limit is two. This ability to show the virtual machine two processor cores means applications that can take advantage of multi-core systems will run more quickly but support for 3D gaming and apps is limited to a basic implementation of DirectX 8.1. It's welcome and means you can play less demanding games, but DirectX 8.1 is a couple of generations behind the current standard and won't power the translucent Vista interface, Aero. Parallels adds OpenGL support as well as DirectX 8.1. Although we expect things to change quickly, right now Fusion lags behind Parallels in integrating the Mac and Windows experience. Sure, it has Unity - a mode similar to, though at present slightly more advanced than, Parallels' Coherence mode, which cuts the Windows windows out of the Windows desktop and lays them alongside Mac windows - but it's not as easy to share files. 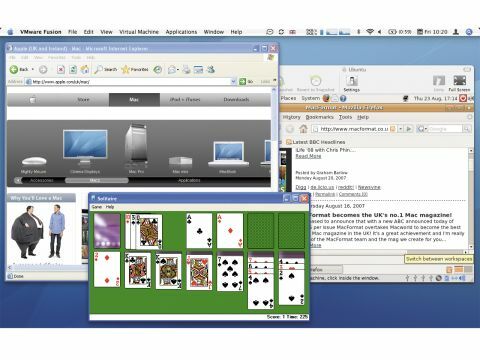 It supports drag and drop, but Parallels has more options, including automatically publishing the virtual hard disk as a share, using the Explorer utility to browse its contents even if the machine isn't running and the innovative SmartSelect option. This enables you to right-click on a document in the host or guest and open it in an application on either. And while both offer the ability to snapshot your system for later roll-back, Fusion is limited to one state. Fusion 1.0 is a great product, and if it weren't for the fact that we'd seen so many of its exciting features in Parallels - Unity, easy Windows installation with just a serial number, using the Boot Camp partition - we'd be more excited. As it stands, Parallels still has the edge on ease of use and features, but Fusion is a credible challenger.